Jet Tec are one of the world's leading manufacturers of alternative inkjet supplies, producing compatible and recycled printer cartridge products. Jet Tec ink cartridges are made in the UK by DCI Ltd and are compatible with the latest and most popular types of printers. Jet Tec has been established for over 25 years at its UK manufacturing base and is renowned for the quality, reliability and patented technology of their products. 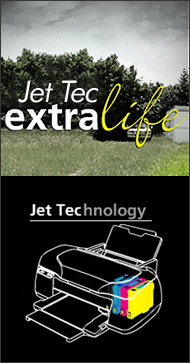 The quality of Jet Tec products is second to none. Jet Tec is an ISO 9001 registered company. ISO 9001 procedures are applied throughout the entire manufacturing facility. Jet Tec's self-reliance in the total manufacturing process ensures the tightest control over quality. 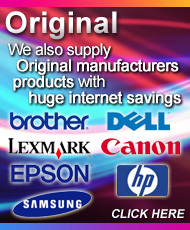 At UKInkSupplies.com we only stock products that we believe represent the best value and quality on the market, we have nearly a decade of experience selling Jet Tec products throughout Europe and the world and firmly believe that switching to Jet Tec will change the way you think about printing. Most Jet Tec cartridges supplied for Canon and Epson printers offer unique technology called "Extra Life". With many ink cartridges it is common to find that the printer reports the cartridge as empty whilst there is still ink in the cartridge. Extra Life technology ensures that every last drop of the ink in the cartridge is utilised - giving you more prints and better value. All Jet Tec cartridges are guaranteed to print at least the same amount as the original cartridge. Jet Tec adhere to the highest environmental processes in the production and design of their cartridges. Many of today's manufacturers of printer cartridges are based in China, with the long distance transportation involved there are huge volumes of greenhouse gases emitted. Jet Tec products are manufactured in the UK and therefore travel a shorter distance. Combine this with the UKInkSupplies.com commitment of using land and sea based transport to transfer our goods between our distribution centres and you can be certain that carbon emissions are kept to an absolute minimum. 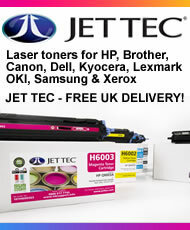 Jet Tec cartridges may look different from the original cartridge supplied by your printer manufacturer. This is because the technology built in to the cartridge is unique and patented by Jet Tec. The cartridges are guaranteed to deliver the same number of prints as the original cartridge and in some cases can deliver significantly more prints than the original. All the cartridges are manufactured in the UK at a custom built facility with the highest quality assurance and manufacturing processes implemented. You want to save money and you still want that photo of your granddaughters first birthday or your son's graduation to look as dazzling as the moment they were taken when you share them with friends and family. Jet Tec cartridges match the original manufacturers guidelines for light-fastness ensuring that your precious moments stay as true as your memories for a lifetime. All Jet Tec products are fully guaranteed against defects due to faulty materials or workmanship. If for any reason you are not completely satisfied with a Jet Tec inkjet product then please return the product to Jet Tec with proof of purchase for a full refund. Jet Tec guarantees that, when instructions have been followed diligently its products will not cause damage when used in original manufacturers cartridges that are not faulty before refilling. Jet Tec shall not be liable for any damage caused when not used in accordance with the instructions. Jet Tec shall not be liable to the buyer if any damage or abnormal wear to a printer that is claimed to have been caused by use of a Jet Tec product, could have been caused by goods not supplied by Jet Tec used in the printer before or after the use of a Jet Tec product. Free Helpline: 0800 0282 488 (Mon-Fri, 8.30am-5pm).